We’ve had a maths breakthrough! How do I know? The children have been asking to do maths first. My confidence in my children’s ability to reach their maths potential (and my ability to get them there) has skyrocketed! 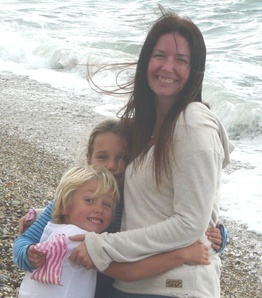 When they were at school, both C (8) and J (nearly 7) enjoyed maths and were top of their respective classes. This was a good starting point, but as a new homeschooler it only increased the pressure I put on myself to nurture their talents at home! I never doubted their mathematical ability; what I did question was my ability to sustain and develop their passion for the subject. I think my biggest enemy was that spectre that looms over most homeschoolers in our weak moments: fear of leaving gaps in our children’s education. This fear seems to strike frequently when it comes to maths, so perhaps it’s not surprising that many of us devote huge amounts of energy to finding the “perfect” maths curriculum. 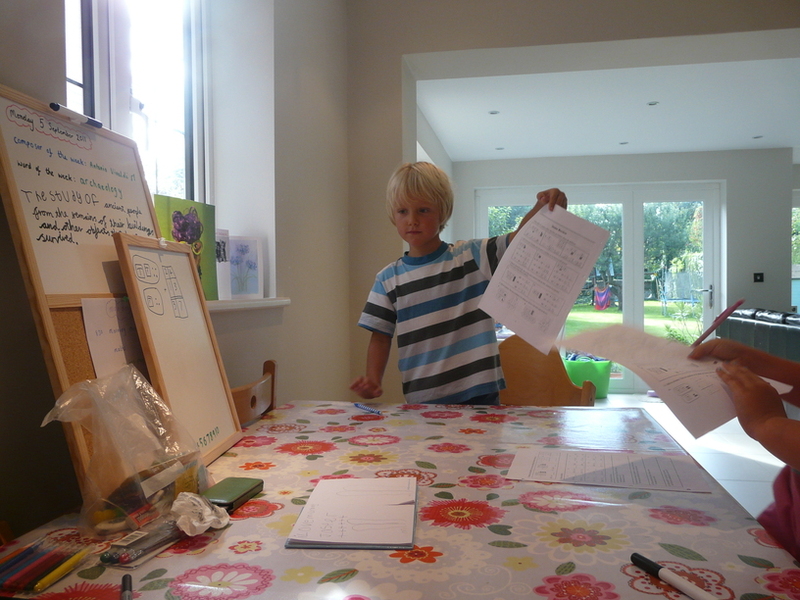 But here’s what I’ve found: for my children, most maths curricula probably work just fine for a while. And then … well, they just get bored of doing the same thing day in day out (or at least the same sort of thing in the same sort of way). And boredom is definitely not a good learning state! Then, thanks to the lovely folks over at the Secular Homeschool forum, I discovered Primary Grade Math Challenge. 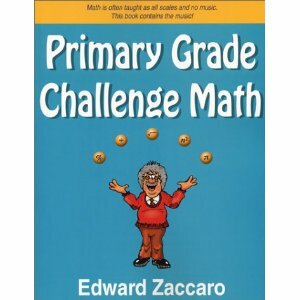 This is a book of word problems aimed at gifted maths students (grades 1st – 4th). 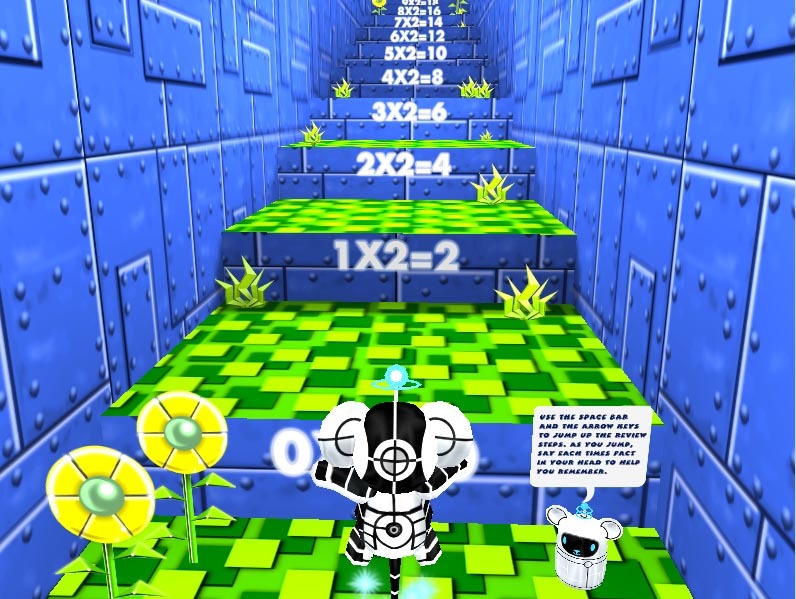 Each chapter introduces a theme (such as completing a number series, or counting change) and then has four sets of questions ranging from “level 1” to “genius”. It may not sound very exciting so far, but sitting with each of my children in turn as they work through the questions has given me is an incredible insight into how their minds work and what their strengths and weaknesses are, in ways no math curriculum has ever done. Meanwhile my puzzle-loving children love figuring out the answers and seeing how many levels they can complete in each unit. Up until now I’ve continued to pick out a few sections of Math Mammoth (grade 2) for C to do once or twice a week, but writing this post has helped me let go of that, unless there’s something specific she needs to work on. She doesn’t need to practise place value or rounding to the nearest hundred, and I don’t want to bore her into “hating” any other mathematical concept. 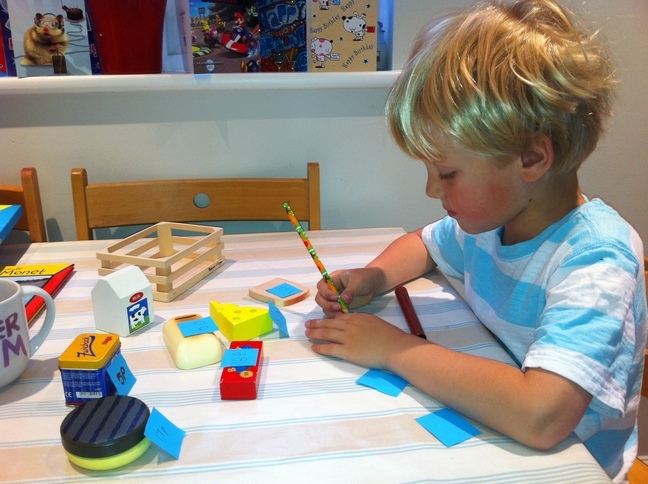 Yes, C and J need to master their number facts, know their multiplication tables and learn about different types of triangles, but they can acquire all those skills in day-to-day life (eg by baking and budgeting), by playing games, and from living maths books. One of the things I like about Math Mammoth is that you can buy material on a specific topic if you don’t need the complete curriculum. I’ve got my eye on the multiplication and division worksheets collection to help C and J master those operations when they reach that point (which given the way Primary Grade Math Challenge is going, probably isn’t far off). 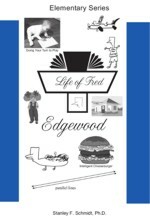 Finally, this post wouldn’t be complete without a mention of our beloved Life Of Fred. These books are not cheap but – oh – they are good! Once I had found a UK supplier (thank you Conquest Books) I splashed out on the first four elementary level books, which C whizzed through, and I’ve since bought the complete set. (I figure they’re good quality non-consumables so should I should be able to get some of my investment back by re-selling at some point – if we can ever bear to part with them!) My reluctant reader J, meanwhile, is happy to alternate reading aloud paragraphs with me for chapter after chapter – I don’t think he notices he’s even reading, let alone learning maths! Seriously, I can’t recommend these books enough if you want to your kids to associate maths with laughter and generally feeling good. I’m so happy to have found what works for us (for now!). I know this exact approach won’t work for every family or every child, but if you’re on the verge of jumping off-curriculum with your mathematically-able child – come on in, the water’s just fine! What an exciting time of year this is. Looking ahead to a new year, a new term, and spring! (Yes I know winter has officially only just started, but there’s something about the days beginning to get longer and the promise of imminent snowdrops that fills me with hope!) Last term, which marked the start of our first full academic year as a 100% homeschooling family, we’ve been more structured than before. In this series of posts I’m going to look at what we’ve been using for curriculum and talk about any tweaks and changes I’m planning for the coming term, starting with maths. For maths, we’ve been using living books and the Math Mammothcurriculum. 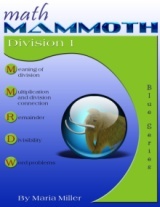 I love Math Mammoth. The level is just right for my children, and as there isn’t a separate teacher’s book, it’s very easy to use. 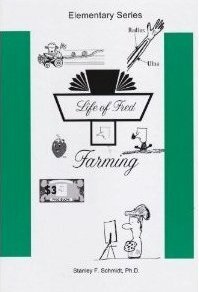 It is inexpensive and comes in electronic form to print at home – useful when you live outside the US. There is also a separate UK money section, and I like that the sections on measuring cover both imperial and metric units. UK schools have taught only metric since I was in school, but in the real world we use pounds, inches, miles, etc, so the children may as well know about them! We’ve read a few living books, like Sir Cumference and the Great Knight of Angleland. I love how these books introduce mathematical concepts and vocabulary in the context of fun stories. We do maths four days a week, but I’ve found that in order to cover all the material in Math Mammoth, we haven’t been spending as much time on living maths as we’d like. To address this, I’m going to go through the Math Mammoth material ahead of time and pick out the essential bits, so that we can spend slightly less time on workbooks and more time really enjoying real maths. Here’s a list of some of our living maths books from my Library Thing catalogue. I’m excited to have just found a UK supplier of Life of Fred, which I’ve been considering investing in since they brought out their new elementary series recently. (See Conquest Books.) 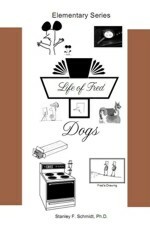 I’ve read great reviews of Life of Fred, and I have a feeling my children will love them. Last year we tried an online curriculum (Maths Whizzi), a few National Curriculum workbooks and Singapore Math but nothing really felt right. 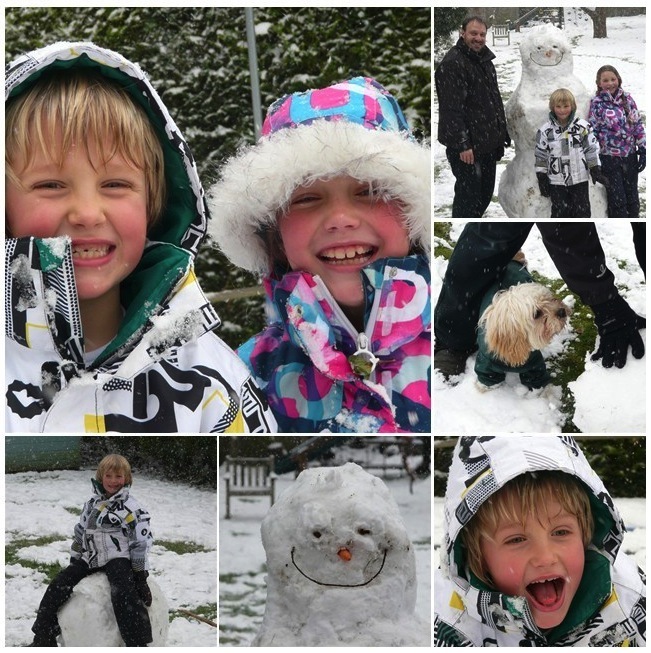 With the online curriculum, our experience was similar to other bloggers in that the children started out really keen but over a few weeks enthusiasm took a nosedive and maths became “hard” and/or “boring”. Maybe because online programmes reward children for completing lessons with points (which can be saved to buy eg “toys” in a virtual bedroom), which erodes natural, intrinsic motivation to solve the fun puzzles that are maths. (1) It’s available as an eBook which saves me any issues of having to track down a UK supplier and/or pay huge postage costs. I love eBooks! (2) Although it’s American, it comes with a separate British section on money to replace the dollar section. (3) There’s no separate teacher’s book to juggle while teaching. Everything is in one main worktext. (4) The material is clearly laid out so I don’t have to lesson plan. All I need do is have a quick glance at what’s coming up so I have an idea of what I’ll go through on the whiteboard together before C and J practise. The notes even guide you through a process to let you know how many pages you need to cover each week if you want to finish the course within your homeschool year – one of those obvious planning points that hadn’t occurred to me before! Not that we’ll necessarily do every single sum, but I find it useful to have a rough idea of where we are, to make sure we cover the important bits. Both C and J are pretty quick at maths, but J is exceptionally quick, so I’m using Math Mammoth (light blue series) Grade 2 (British Year 3) with them both. They seem to be enjoying working together, and having C alongside helps me cope better with J’s (utterly foreign to me!) whole-to-parts visual-spatial learning style. J gets to see that there can be advantages to working through the steps before shouting out the answer, and C loves helping explain the steps – I remember she once told me that helping the other children was one of her favourite things about school! One of the things I love about home educating is being able to work at each of my children’s individual pace, skipping laborious drills on things they grasp quickly while allowing them a little more time on topics they’re having trouble with. J gets most maths concepts pretty quickly but a few random answers yesterday gave us a great opportunity for some hands-on maths fun today. J first gathered up some things to sell in our “shop” and then set about making price tags with an enthusiasm I’ve never seen in him for any other kind of writing (“no, I want to do them all!”). 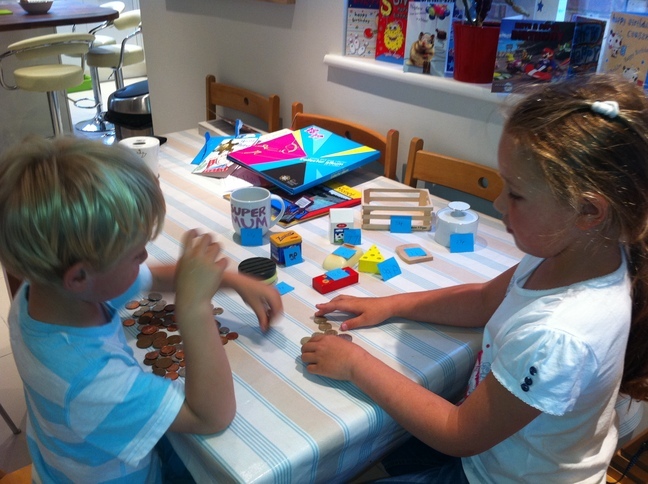 His money box, heavy with dozens of copper and silver coins, also came in handy. C, of course, wanted to join in the fun, and we took turns playing shopkeeper, customer and shop assistant, counting out the customer’s change as we filled our baskets. Much as I admire parents who enjoy spending hours playing “let’s pretend” games, I’m really not one of them. If someone had tried to tell me a few years ago how much fun I’d have playing shop with my children, I’d have been sceptical to say the least! But the buzz of putting into practice ideas I’ve been immersing myself in since I began this wonderful home educating journey, combined with the thrill of seeing first hand how effective they are, make for a pretty magical experience! As an almost unschooling mom says, “it’s great to be a homeschooler”.